Subpar second-quarter results at Bon-Ton Stores and J.C. Penney bode ill for Sears Holdings' upcoming earnings report. Sears Holdings (NASDAQOTH:SHLDQ) got off to a terrible start in 2017. Comparable-store sales plunged by 11.9% in the first quarter, and the company posted an adjusted loss of $222 million before interest, taxes, depreciation, and amortization. The combined impact of declining sales and margin pressure more than offset the savings from Sears Holdings' cost-cutting plan. Surprisingly, Sears Holdings' stock price has increased in the three months since it released its first-quarter earnings report -- even as shares of other retailers like J.C. Penney (NYSE:JCP) have continued to plunge. 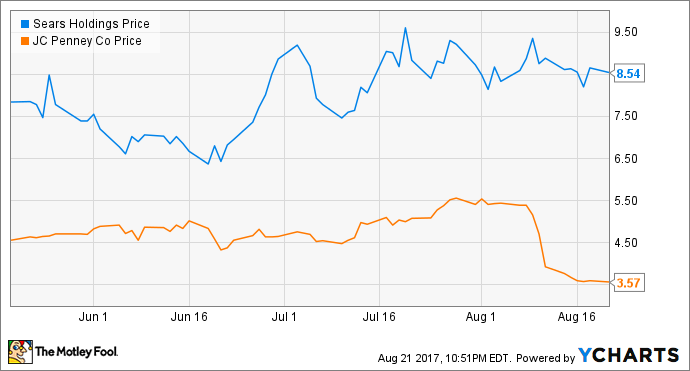 Sears Holdings vs. J.C. Penney Stock Performance. Data source: YCharts. However, there's no reason to expect that the second quarter was much better for Sears than the first. In fact, recent earnings reports from Bon-Ton Stores (NASDAQ:BONT) and J.C. Penney suggest that Sears Holdings probably had another dreadful quarter. Sears' management has been fairly quiet for the past three months, aside from announcing a deal to start selling Kenmore smart appliances through Amazon.com and the opening of a new Sears concept store that sells only appliances and mattresses. In June, the company laid out the next step of its cost-cutting plan: another organizational restructuring. At the time, Sears Holdings confirmed that it is on track to implement $1.25 billion of annualized cost savings by year-end. Sears hopes to cut costs by $1.25 billion this year. Image source: Sears Holdings. Sears also closed on more than $200 million of asset sales during June, allowing it to pay down some of its debt. Most of that came from a $187 million deal to sell its store and surrounding land at South Coast Plaza in Costa Mesa, California, to the mall owner. Sears will lease back the store for now, but the property will eventually be redeveloped. If Bon-Ton's second-quarter results are any indication, investors shouldn't get too excited about Sears' upcoming earnings report. Bon-Ton and Sears have frequently been mentioned alongside one another recently as the two department stores most likely to file for bankruptcy within the next year. In an industry that's really struggling, these two companies are having by far the most trouble. Comparable-store sales fell by an unseemly 8.8% at Bon-Ton Stores in the first quarter. Bon-Ton's underperformance continued last quarter, with comp sales down 6.1% year over year. Even if Bon-Ton's sales trends improve dramatically in the second half of the year, the company will report another steep loss in 2017. This performance persistence seems to indicate that certain retailers -- like Bon-Ton -- have lost their relevance with consumers, causing them to routinely underperform the industry. Sears Holdings surely fits in this category as well. In early January, Sears Holdings announced that it would close 150 stores during the first quarter of fiscal 2017. Since then, Sears has identified more than 150 additional locations to shutter. This later wave of store closings is being split between the second quarter and the third quarter. Sears hopes that store closures will help it reduce its losses, while also freeing up some cash in the near term from inventory liquidation. However, J.C. Penney's second-quarter results demonstrated the significant financial impact of closing stores en masse. J.C. Penney reported a larger than expected adjusted loss of $0.09 per share last quarter, as gross margin plunged by a full 2 percentage points. Management blamed the decline on the sheer number of store liquidation sales going on during the quarter. Store closures weighed on J.C. Penney's second-quarter results. Image source: J.C. Penney. Sears Holdings' dreadful first-quarter results also support the notion that closing more than 100 stores within a short period of time is bound to cause some pain. With liquidation sales running at numerous stores during the second and third quarters, this headwind will continue for Sears. J.C. Penney also reported strong growth in the appliance business last quarter. Its market share gains are probably coming at the expense of Sears, the only other department store that sells major appliances. Sears Holdings bulls typically note that the company has lots of assets, including still-popular brands like Kenmore and DieHard, along with millions of square feet of owned real estate. Yet this collection of assets is steadily shrinking. Sears has already sold most of its best real estate; the South Coast Plaza store was one of its few remaining gems. The company also sold its Craftsman tool brand earlier this year. Meanwhile, Sears continues to hemorrhage cash at an alarming rate. The company burned nearly $1 billion of cash in the first quarter alone. Furthermore, the company has more than $12 billion of liabilities on its books. Sears Holdings may be able to stave off bankruptcy for another couple of years, but in the long run, shareholders are likely to see their investments wiped out.